In a fight that should have never been made, WBA/WBO super bantamweight champion (13-0, 8 KO’s) easily beat a ring-rusty veteran Joseph Agbeko (29-5m 22 KO’s) in winning a ridiculously easy 12 round unanimous decision on Saturday night at the Boardwalk Hall in Atlantic City, New Jersey. 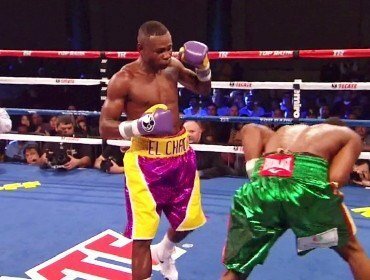 Rigondeaux was too fast for Agbeko, and was able to hit him cleanly with left hands all night long. Agbeko tried hard to land his shots, but he was too slow and way out of out of his class. It was one of those fights where the class between the two fighters was too far apart for the fight to be competitive. No doubt, Agbeko could have been more aggressive to try and win the fight, but it looked like he made up his mind he was just going to go the distance and not do what he needed to in order to win the fight. The fight was so overly one-sided that the fans booed from the 1st until last round. You rarely see that nowadays where fans boo every round, but they did with this fight. A big part of that is obviously due to the poor match-making by sticking a fighter like Agbeko, who has fought only once in two years, and signing him up to fight the best super bantamweight in the division. Fighting for the first time in a year and a half, junior middleweight James Kirkland (32-1, 28 KO’s) defeated Glen Tapia (20-1, 12 KO’s) by a 12 round technical knockout. This fight actually should have been in the main event because it was far, far superior to the dull mismatch between Rigondeaux and Agbeko. Kirkland briefly had problems getting to the mobile Tapia in the opening round, but he caught up to him and forced him into a war along the ropes. Tapia didn’t have the inside fighting skills for that kind of a fight, and as a result he became little more than a punching bag for Kirkland to throw his nonstop punches at for 6 rounds. The fight was finally stopped by referee Steve Smoger in the 6th due to Tapia not throwing punches back. Kirkland was throwing so many punches that he seemed to lose a lot of the power on his shots. But with him throwing and landing so many punches to the head and body of Tapia, he was still able to wear him down to the point where Tapia’s face was swollen badly by the 5th. In between the 4th and the 5th, the ringside doctor looked to be on the verge of halting it, but he let the fight continue for some reason. Tapia then responded with a halfway decent round in the 5th by landing some big shots that snapped Kirkland’s head sideways. However, Kirkland still punished Tapia in the 5th, and in the 6th he unloaded everything but the kitchen sink until referee Steve Smoger finally stepped in and halted the bout at 0:38 of the 6th. Middleweight Matthew Macklin (30-5, 20 KO’s) won a 10 round unanimous decsion over Lamar Russ (14-1, 7 KO’s) The judges scored it 96-94, 97-93, 98-92. Macklin had difficulties landing his punches through the guard against the 6’2″ Russ, both because of his ability to pick off shots with his gloves and also due to Russ moving a lot during the fight. Frequently, Macklin’s shots would come up short due to Russ moving away from what he’d previously been standing. Although Macklin did a good job of staying with Russ while he moved around the ring, Macklin sill had a hard time landing. When he did land his shots, there wasn’t much on his shots due to him fighting on the move and being unable to set his feet to get maximum power. Russ seemed to gather confidence in the last two rounds, as he caught Macklin with some big shots to the head that took the fight out of him and made him cautious to throw punches. Russ then came on in the 9th and 10th rounds, and was able to land some nice punches to the head of Macklin. Russ gave away many of the rounds, however, just by moving and not throwing enough punches. Macklin was able to follow Russ around and win the rounds based on effective aggression. Super middleweight Matt Korobov (22-0, 13 KO’s) defeated Derek Edwards (26-3-1, 13 KO’s) by a 9th round TKO. Korobov knocked Edwards down twice in the fight, once in the 7th, and another time in the 9th. The fight was stopped in the 9th after the knockdown. Korobov gave Edwards far too much respect in this fight, and he probably should have been able to win a lot easier than he did.